Located in the Delmas region of Port-au-Prince, the Avanse Healing Center provides daily support to children living and working on the street. Here, they can wash themselves, eat, receive treatment for wounds or illness, play, and participate in education and cultural activities. Avanse has on-site social workers to learn more about children coming through our center. Children in need of education and a safe place to sleep are profiled according to our VAST protocol in order to match them with a boarding school that offers education, nutritious meals and a safe bed at night. This is the first dynamic step to their reintegration. The Avanse Soutien Center for Children of Cite Soleil provides a residential home for street children coming from the Cite Soleil slum in the most desperate need of safe, adequate housing and education. Here they are loved and brought up by our caregivers and social workers. They attend a private school near the home, play, participate in sports, cultural activities and programs unique to their individuals needs. Our on site social workers offer emotional support and healing from their lives before coming to Avanse. 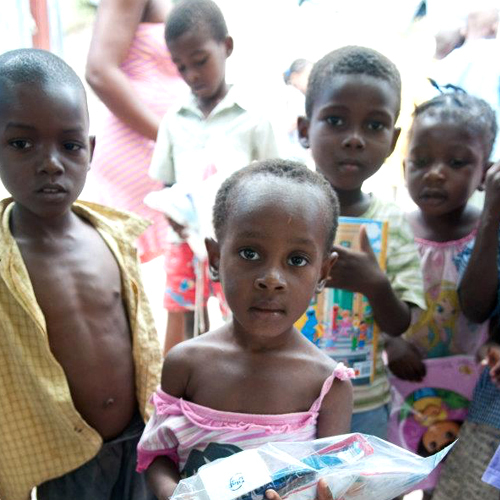 Avanse conducts community outreach four times a year in Cite Soleil. This helps us to stay connected to the community, and those most in need of support, but unable to join our programs due to age or situation. During Community Outreach, Avanse provides donations or services to the community, including school supplies distribution, medical services and toy distribution during the holidays. We use the term ‘street children’ but there are many terms to describe the children we work with and for. Homeless youth/children, street children, runaways, children in street situations are just some of them. We give aid to children of and on the street. These are children who depend on the streets for their survival, and do not have adequate care, supervision, house or a combination of the three to provide for their growth and development. Haiti's largest slum, Cite Soleil houses over 400,000 people living in abject poverty. Due to increased gang conflict in Cite Soleil, over 80% of NGO's have withdrawn their aid efforts throughout the slum. This in turn has left hundreds of children alone without aid. A street child in Cite Soleil has minimal odds of surviving life on the street unless they are recruited into gangs. Alone, they will often die due to starvation and disease.